There are plenty of things we don’t really need in our rural Mallorcan lifestyle: earplugs to drown out the sound of noisy neighbours (although the wildlife can sometimes assault the ears); designer footwear (except perhaps by Hunter or Dr Martens), or a lawn mower – just to name a few. But as we live in a rural area untouched by public transport, a set of wheels is essential. Preferably four of them (and a spare, of course). We had this driven home (pardon the pun) when our overworked Toyota RAV 4 broke down in August while I was on the way to interview the artist Arturo Rhodes in Deià for abcMallorca magazine. The Boss had decided to come along for the ride but, as we approached the Sóller tunnel, dark smoke started to belch from the car. Goodbye turbo. The interview was hastily postponed and we had a breakneck-speed ride back to the Toyota garage in Manacor in a grua (tow truck). Long story short, there was no way to tell whether a replacement turbo would be the solution. The mechanic was 90 per cent sure the engine was OK, but obviously couldn’t tell definitely until a new turbo was fitted. A large sum of money was exchanged for a car that worked again – and, for a while, better than it had for some time. Fast forward a few weeks and a new problem developed: if the engine was cold, it started easily. If the engine was still warm from recent use, it wouldn’t re-start. 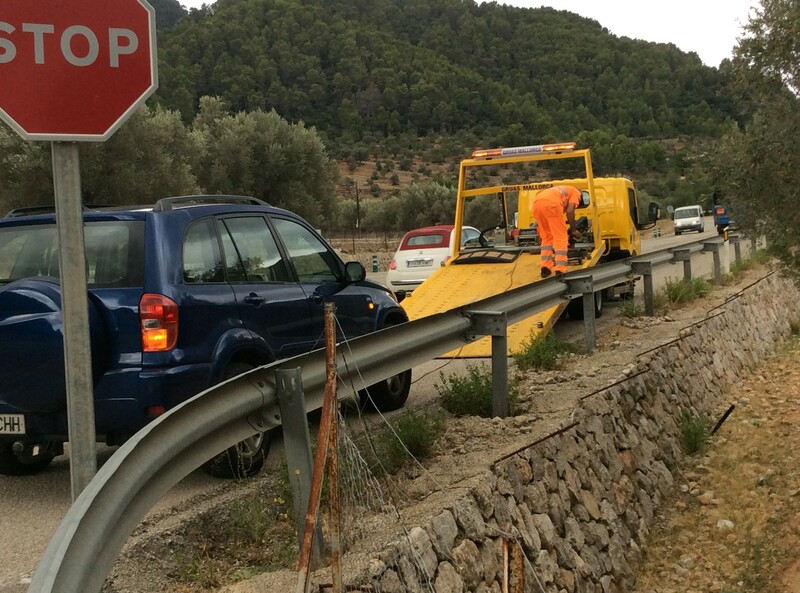 We experienced this several times – including one rather alarming one when the engine died in the middle lane of Palma’s Via Cintura – the motorway around the city. Amidst blaring horns (it was rush hour), we somehow reached the hard shoulder, where we donned flattering fluorescent waistcoats to stand out of danger. Three-quarters of an hour later, the engine had cooled sufficiently to enable us to restart the car. Our garage declared our much-loved car a terminal case. Unless we wanted to invest in a new engine. The car was already of an age (and mileage) that meant we had been contemplating replacing it in the not-too-distant future, so The Boss buried himself in the task of finding a replacement vehicle. Because we need a 4×4, to tow a trailer-load of logs home regularly in winter, our budget would stretch only to a secondhand vehicle. Buying a secondhand 4×4 isn’t easy on Mallorca. Unlike in the UK, many car dealers offer few used vehicles. We even looked at what was available for sale in Barcelona, just in case there was something that would make the journey worthwhile. In the end, we were fortunate to find one that fitted the bill in Manacor. A fortnight ago it became ours. Next week a tow bar will be fitted and we’ll be able to collect our first load of logs for autumn. It’s just as well that Mallorca’s been enjoying what our neighbours call el veranillo de San Martín – a little Indian summer . . .
Only one of our cats has so far climbed up to sit on the roof of our new car. 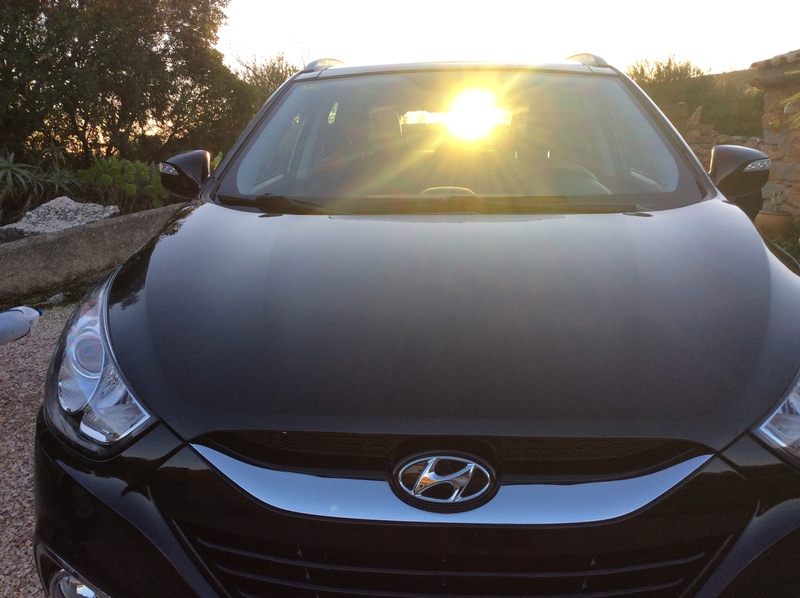 Buying a secondhand car on Mallorca? Car hire companies often sell off ex-rental saloon cars at the end of the season; check websites to see what’s on offer. On Facebook, the page Second Hand Cars Mallorca may yield something of interest. If you buy a secondhand car you become liable for any debts relating to it, such as unpaid vehicle tax, outstanding hire purchase payments, or traffic offence fines. Checks can be made (see below). Zoe Leggett (also specializes in classic car registration). Mallorca Solutions – offers a host of helpful services, including vehicle related. Currently in a similar situation with ancient car about to die. Finding a replacement seems to be much more complicated over here. Sorry, but I didn’t read in your story about what finalisation plans you had for your late 4×4 vehicle. Is (was?) the plan to simply hold a service and then invite friends to pummel the body into nice, tidy, crushable bits? You could sell (could have sold) tickets to this and probably made enough to pay for the new one. Or perhaps the plan is (was) to call your friendly Grua service provider and haul it up as high as possible on Galatxo and then let it slide off? Either option, for a vehicle that let you down in such a cruel way, seems like a suitable end. Oh James, you always make me laugh! If only we’d thought of one of these ideas. At the moment it’s parked in the field, awaiting its fate. It could become a greenhouse, a home for our seven feral cats (since they seem to love it so much), or we could use it as a spare room for visiting family and friends. My guess is that it will go to the great scrapyard in the sky (well, in Palma), or our local tame taxi driver, who fancies himself as a bit of a mechanic and reckons he could get it going as a first car for his son. Must admit the car-over-the-cliff option was tempting . . .
are there e-cars available in Mallorca -as e-bikes I know ? Jan Edwards posted: "There are plenty of things we don't really need in our rural Mallorcan lifestyle: earplugs to drown out the sound of noisy neighbours (although the wildlife can sometimes assault the ears); designer footwear (except perhaps by Hunter or Dr Martens), or a "
Yes, there are e-cars – and several public underground car parks have special charging points. I’ve no idea how much they cost though! E-bikes seem very popular . . .